Never one to miss an opportunity when presented, we phoned in when Jeremy Vine was asking the question - "What can we do about Aleppo?" on his BBC2 show that regularly attracts over 7 million listeners. Nigel managed to get onto the show with discussion about the Pouncer and how it could have helped to deliver aid when the convoys were not making it through and traditional airdrops from a plane were not a viable option due to the airspace restrictions and it being a 'live fire' situation making the plane and crew a potential target. This is where Pouncer tech comes into it's own and, partially, where the main idea was originated as it could have been sent from Turkey, where there was no live fire or air restrictions, to land safely in the city. The use of the Pouncer in this type of situation has been widely discussed on social media and in the halls of power. 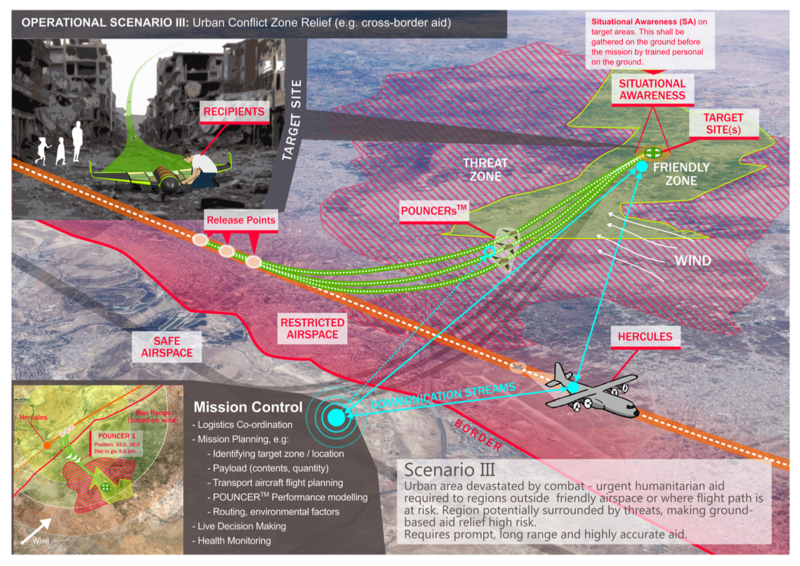 Sadly what the tech can’t do is provide the political will to deliver the UAV’s and potentially annoy Russia and Syrian administration by sidestepping their hold over the city.